If you’ve been to the Balearics, flown to the Canaries, and explored plenty of Spain, Cape Verde is an exciting new-kid-on-the-block destination for your summer holidays. This group of Atlantic islands, just off the coast of Africa, is something of a secret gem - golden sands and some of the best year-round sunshine still within short-haul distance! Take a look at our pocket guide to Cape Verde and discover the most popular holiday islands of Boa Vista and Sal which proudly boast traditional towns, untouched beaches and tropical weather, better still with lots of activites available, it's perfect for families and couples. For more exotic getaways, browse our round-up of the best holiday destinations for 2017. The tropical climate of Cape Verde makes it a perfect all-year-round holiday destination, with the mercury usually fluctuating between 26°C and 30°C. Cape Verde holidays offer long, never-ending sunshine hours with low humidity, so there really is no bad time to visit these beautiful hidden islands. The islands are windier between November and March - when watersports enthusiasts are in their element. The Cape Verde islands are a paradise for outdoor enthusiasts – especially those who keen watersports and looking for a little bit of breeze. Try your hand at surfing, wind surfing, kite surfing, scuba diving, and snorkelling. For those who can’t surf, there are plenty of surf schools in the most popular resorts including Sal Rei and Santa Maria. It's official. When it comes to unspoilt beaches, Cape Verde wins hands down. A flat island that features abundant sand in beaches and salt pans (or salt flats), Sal is a mecca for outdoor lovers and sun worshippers. If you want a day out with a difference, take a trip to Pedra de Lume where you can float in the amazing natural salt lake. For more world-class sands, take a look at our round-up of some seriously beautiful beaches. São Vicente is the main party hub. Enjoy live music daily at the bars and restaurants and when the sun goes down, the town comes to life with upbeat clubs and pubs. Holidaymakers travelling during carnival time are in for a real treat, as the locals celebrate through day and night. To really make the most of your time in Cape Verde, hopping between the islands guarantees a great adventure and is perfectly possible by domestic aircraft. There are return trip excursions between several of the islands available from one to five days in duration, and the cost isn’t as steep as you might think. For example, a return flight from Boa Vista to Sal costs around £88. Cape Verde is a hotspot for whale and turtle spotting, depending on what time of year you visit (whale spotting season runs Feb to May, turtles from June to Sept). Ervatao Beach on Boa Vista is a good place to spot loggerhead turtles, and you’ll find it easy to book onto a whale watching excursion from this island too. Just ten minutes from Sal Rei by boat brings you to the town’s very own little desert island, a tiny stretch of soft sand no more than 2km long and half a km wide. If you’re lucky you might find this uninhibited island completely deserted, apart from its resident crabs and lizards! Among its few landmarks are a small fort (complete with canons!) and a lighthouse. On the warm white sands of Santa Maria beach, this four-star is a masterclass in luxury, from its perfectly line-up of sun loungers to its sparkling pool, rejuvenating spa, and a large sun terrace. The hotel boasts its seafront Beach Club restaurant, comfy, contemporary rooms, and outstanding facilities. All this relaxing luxury is just a five-minute walk from Santa Maria town centre, and mere steps from the sands. 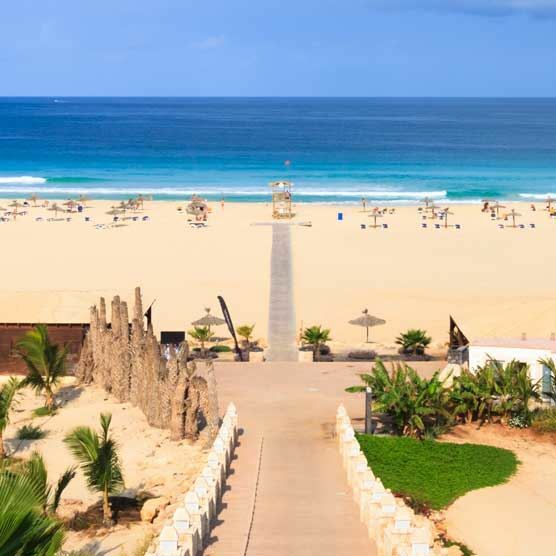 Set against a backdrop of unparalleled beauty of Boa Vista, Iberostar Club is an all Inclusive 5-star resort in Cape Verde located along the stunning beach of Chaves. Book this hotel and you’ll be perfectly placed to explore the sand dunes from your doorstep, and can benefit from a five star stay in the lap of luxury. The hotel boasts comfortable and spacious rooms designed to meet your every need with sparkling pools for adults and children, plus a sumptuous spa and fitness zone. The hotel offers the finest culinary offer serving a wide selection of local and international dishes, plus a themed restaurant offering multi-cuisine dishes for the holidaymakers with international taste. This three-star hotel is a great value for money choice on Santa Maria beach, boasting pretty contemporary rooms and bungalow accommodation, three sparkling pools, a sun terrace, a club for kids, wellness centre, and plethora of activities to keep you busy including tennis, volleyball, and beach football. You have options to eat at the international or traditional buffet, or go gourmet in the a la carte restaurant, plus the hotel puts on poolside BBQs once a week. This hotel is a great choice for families thanks to family rooms and family bungalows with plenty of space for four. The kids will also love their own pool, kids’ club, and the daily Smartline trolley that serves fresh fruit and ice-cream as part of the all-inclusive package. You’re right on the beach here, and the hotel has a lovely traditional feel with a leafy central courtyard dotted with tables and chairs. The rooms are simply furnished but comfortable, and set within lush green gardens. Why not head for the chill out bar after a gym and swim session, to round off the day nicely? Fancy ramping up the luxe-factor? This award-winning five-star resort sits on the sands of Algodoeiro Beach, just 10 minutes from Santa Maria town, meaning you get that away from it all feeling with all the benefits of a popular resort nearby. Every area of this hotel, from the modern rooms to the tranquil wellness centre, is smart and impressive, and we love the distinct characters of the pools, from the quiet one to a busy pool-sports zone. You’ll also have a great choice of places to eat and drink on the all-inclusive package, including a beach club restaurant with gorgeous views and the Aqua Mediterranean gourmet restaurant. Every member of the family is sorted with the daily activity programme – we love the fact that you can snorkel at the beach’s own coral reef!